Mom sent an email with two photo attachments, and a few words. Simple, unexpected emails like this make my day. Sometimes it’s a short, “hope your day is going well” or, “they ran out of Saint Germain strawberry shortcake today.” But the best emails are those which come with photos of Buddy, the family dog. This is Buddy in the bathtub. My little fellow is composed of 80% plushy golden-brown fur. The other 20% is meat, bones, and fat. He’s a happy dude, and only enjoys being showered by grandma or mom. This is Buddy post-shower. When he was a tiny munchkin we rubbed him down with a towel and then let him roam around till he was completely dry. A horrible mistake. Buddy would come trampling back into the kitchen with all sorts of weeds, nublins, and sometimes ladybugs, attached to his fur. He would don a sheepish smile and then smoosh himself around your ankle, depositing a trail of tiny black and red ladybugs. So now we blow-dry Buddy, with the heat set on medium-low. He enjoys the blow dryer, especially on colder days, but the heat makes him rather sleepy. Back in NYC, dinner two weeks ago with Don involved a grill, tomatoes, avocados, garlic, steak and a hammock – elements I have quickly learned to associate with summer in the city. Of them all, I must say the hammock is most important (with avocado coming in a close second). Avocado is creamy blessing in any forms – brushed with olive oil and grilled, whipped into a milkshake, and deep fried in a light batter. Back in Hawai’i, gorgeous ripe ones fall off the neighbor’s tree and roll right into our backyard…a luxury surely taken for granted. We’d pit halved avocados and drizzle a bit of shoyu in the middle – spoon and eat. In the afternoon, or for a morning sweet, replace the shoyu with light sprinkles of sugar and mash and mix in the shell. Indulgence of the best sort. But when you have a big bag of chips on the picnic bench, what better to do than guacamole? A duo of avocados, tomatoes, fresh lime juice, and salt and pepper to taste. It doesn’t get any more simple. …with olive oil and a touch of salt. Pictured above is an open bulb picked from the scape ends…baby garlic! Now how adorable is that? Steak from Ottomanelli and Sons in the West Village…. …then slipped onto the plate, devoured a minute later. Baguettes, and pasta with tomatoes round out the meal. …a few treats Don picked up earlier in the day from Amy’s Bread. Don once mentioned of his affection for Amy’s chocolate chip cookies, specifically noting the large chunks of salt embedded into the dough. The cookies were slightly soft upon purchase – perhaps due to summer humidity. But a short trip in the oven to crisp up the cookie and warm the chips down to chocolaty pockets proved wonders. …along with a chewy caramel cashew bar! No worries, the sweets were not all polished off in a single night. I was careful to allocate them over two sittings. Bacon, Butter, Basil, Chicken, Cherries, Chocolate, Egg, Hamachi, Hazelnut, Lamb, Peaches, Peas, Ramps, Tofu, Strawberries, Skate, Shortcake…Huzzah! Sunday night with Don, Lauren, Kathryn, and Dan at…where else? Momofuku Ssäm Bar! Below, photos and captions of dinner with a few very delightful dining companions. …gelato at all times on all days. It’s a blessing/curse that I live but a two-minute walk from Il Laboratorio del Gelato on Orchard Street. Priced at $3.25 for a small serving, cravings are easily satisfied at a tiny price. Flavours rotate on a frequent basis, insuring that boredom flavour repetition is far off the horizon. Below, a half-dozen summer gelato shots. 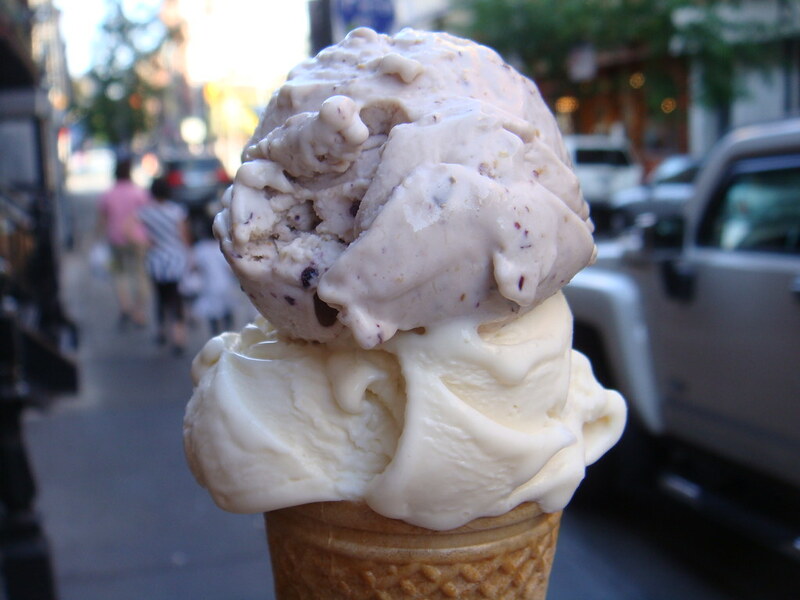 If the gelato comes in a cone – then you may automatically deduct that it is my order. I have Il Lab’s gelato no other way. If you spy a red watch in the photo, that would be Robyn’s gelato. All others in a cup belong to my dear roommate Shann. Don and I made a short bike ride over to Alidoro in Soho last Saturday morning. I’ve attempted to visit the sandwich shop once before, not very wisely at 12 noon on a weekday. The line poured onto the street and the gentleman in front of me estimated a 45 minute wait. There are better things to do than dilly dally in line. So I strolled over to Granddaisy Bakery for warm slices of pizza bianca and vowed to return another day. And so Saturday morning it was, and what a splendid idea, for the shop was completely empty of customers save for a few that trickled in during our morning meal. I find the menu unnecessarily long…endless variations on a few ingredients. It would be more efficient to simply list out the meats, cheese, and bread. Seeing as they’ve already listed nearly every combination possible, customers would create their own sandwich, and be charged accordingly. At first sight, sandwiches are not cheap, hovering in around the $10 range. Add in a drink, “upgrade” the bread, and it a $15 handheld lunch. No worries though, both quality of ingredients and size more than justifies the price. A single sandwich easily feeds two, or doubles for another meal. Pictured above is my order, the “Matthew’ – a very simple creation of prosciutto, fresh mozzarella, dressing, and arugula on white bread. Don went with the “Pinocchio” – prosciutto, sopressata, mozzarella, sweet roasted peppers, and olive paste on sfilantino. Gorgeous and well-composed, each ingredient and flavour is clearly well thought-out. I’m happily satisfied but far from bowled over. Overall? The prices are more than justified, but I’m still partial to the sandwiches at Mama’s (aka Leo’s Latticini) in Corona. Based on taste alone, Alidoro produces a slightly superior product, but the trio of affable sisters who run Mama’s and kind hospitality bestowed upon every visitor counts for so much more in the end. …has neither chairs nor a proper dining table. 250 square feet shared between two people – it’s lucky we get along so well, having gone to both middle and high school together. On the rare occasion that we dine in, we sit on plushy square pillows and place food on two feet high Ikea tables. When the weather is nice, we’ll sit on the fire escape and watch people passing by down below. And on some nights, we use Shann’s windowsill as a makeshift dining table, and her bed as one long bench. …we don’t have an air-conditioner (and recently learned that we are the only apartment in the entire complex without air-conditioning), so we responded to the heat by spinning together ice cold seltzer water with a summery splash of Red Jacket Orchards’s cherry-apple juice and a squeeze of lime. …followed by supple and creamy sweet burrata from the nearby DiPalo’s. And because one type of cheese is never enough when you can have two, we carried on with a pound of fresh ricotta. …and paired that with the tomatoes, pesto, and burrata, doing a rather thorough job of cleaning out the addictively creamy innards.